I want to use a uart protocol to send data to-from a PC, using the j11 USB/UART-JTAG connector on a Zybo Zynq7000. Simply put, my problem is that I don't know where to map the tx/rx wires. In other boards it is clear which pins I should use. In the zynq-7000, the Zybo-Master.xdc file does not have these (only clock, PMODs, leds, switches and buttons). From the zybo Reference manual (page 12), MIO48 and MIO48 are the 1.8V tx-rx pins that receive the serial data converted from the USB packets through the FT2232HQ USB-UART bridge. The problem is that I cannot access those pins. My source is a simple, generic UART code in verilog. I'm using VIVADO. I've tried to create a Block design, enabling the UART1 on the ZYNQ7 Processing System and exporting the xdc file, but apparently it is forbidden to place any wire on the C12 and B12 sites (the physical pins for the MIO 48&49, if I understood correctly. Essentially what I need is a tutorial to create a project in verilog to communicate via the serial port available at the USB bridge. You can see the TX RX locations either in the schematic or in the XDC that we provide. In order to send data to the PC you can simply use the board's Micro USB connector (the same one used for programming). Here is a demo project which uses UART to send data to the PC. Also, when creating a project, you should use the board files. This way Vivado will automatically use the correct constraints for the board and it will help you speed up the project configuration. Let us know if you are still having trouble. Probably, since the UART 1 is coupled to the PS I should build an IP block first, but I was not able to find this instance (UART) within the demo project you linked. Maybe it is indeed a problem still beyond my limited knowledge. I will try to learn a bit more and then re-read this. :-) Thank you anyway. Sorry for confusing you, my answer was not quite correct. The UART in this case has nothing to do with the UCF or the schematic, it is entirely controlled from the ZYNQ PS. In order to use UART you will have to activate it in Vivado. Open the Block Design where you should see the ZYNQ PS, double click on it and then go to "MIO Configuration" and in the "I/O Peripherals" menu you have to check UART 1. UART 1 works on MIO 48 and 49. After that you can go to "PS-PL Configuration" -> General where you can set the baud rate. When this is completed you can go to SDK. 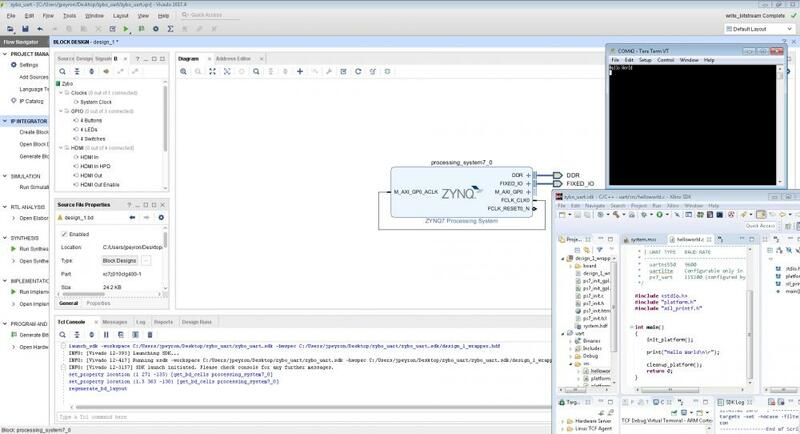 Here is a zybo(zynq) tutorial that uses the usb uart in sdk. Please describe more about your project. i basically want to use only ps side of zynq , for uart communication between zybo and pc, so for this i took zynq 7 ps ip, then i create hdl wrapper , now i just want to know what things are necessary while writing program in sdk. You can use the hello world template in sdk to see how to use the uart or the tutorial i linked above also uses the uart to communicate to a pc with sdk.Also i would suggest something like tera term on the pc as the serial terminal for communication. the above mentioned tutorial is perfectly working,," thank you ", for that . I attached below a block design, sdk code and tera term showing communication to the pc. I use the zybo board files when creating the project. The did block automation and the clicked into the zynq ip block design and removed all but the uart connection. Then i connect the FCLK_CLK0 to the M_AXI_GP0_ACLK. I them created a wrapper and generated a bitstream. Then exported the hardware including the bitstream and launched sdk. In sdk i created an application using the hello world template. If you are trying to use the usb otg here is a forum thread that will explain why this will not work with out using a embedded linux platform like petalinux. I believe your question was answered in the post here. I am also trying to use UART. But I want to access UART from the Microblaze instance of the Zybo FPGA. Please let me know how it can be done. Welcome to the forums! I have not used Microblaze in a Zynq design as of yet. Here is a non-digilent tutorial Hello World on Microblaze UART on PS in Zynq Processor that discussed doing this that should be helpful. Thank you. This seems like a solution that could work. I am actually trying to get FreeRTOS on Microblaze in Zynq FPGA. Do you also have any references for me to achieve this. Here is a Avnet forum thread that discusses this but no response. I have no experience with this topic. You might also want to reach out to FreeRTOS and Xilinx support about this question.